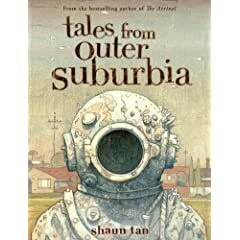 Summary: Welcome to the unforgettable world of Shaun Tan. In his latest book, he mixes incredible illustrations with very short stories that describe the fantastic world that is Outer Suburbia. It is a place where familiar things like holidays, honeymoons and maps are turned upside down, where stick figures and paper scraps come to life, and water buffalo point you in the right direction. Some tales will make you laugh, some will haunt your dreams, and all of them will make you look at your life a little differently. I am not often at a loss for words in describing a book – is it a book, or is it art? – but this magical little masterpiece has me stumped in the best possible way. Who will like this book? : Fans of fantasy. People who like to get a lot of story out of just a few words and pictures. If you like this, try this: Robot Dreams by Sara Varon. The Arrival by Shaun Tan. The Day I Swapped My Dad for Two Goldfish by Neil Gaiman. The Invention of Hugo Cabret by Brian Selznick. This entry was posted in Graphic Novels, Science Fiction and Fantasy and tagged happy, illustrated, magical, strange. Bookmark the permalink.